Chiptuning is an effective way to reduce consumption and increase performance of your vehicle while maintaining all emission standards and engine life. Specialist in chiptuning DIESEL TECHNIK offers branded chiptuning. 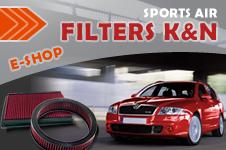 We have been working in this business since 1995 and thanks to it we absolutely master the car chiptuning. The proof is not only a 24 months warranty on the work, but also 14 days money-back guarantee and guarantee of installation of engine into the original condition.